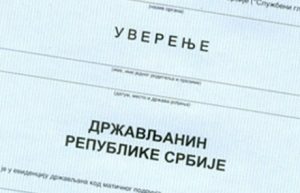 A new Law on Supplementing the Law on Citizenship of the Republic of Serbia has been adopted In Serbia, which allows for the citizen of the SFRY, or a citizen of another republic of the former SFRY, or a citizen of another state originating in the territory of SFRY, who on December 31, 2016 and on the day of filing the application has a registered residence in the Republic of Serbia. An application on the basis this legality may be filed within one year and no later than April 3, 2019. (Article 3 of the Law on Amendments to the Law on Citizenship of the Republic of Serbia). The cited legal basis encompasses the category of individuals who have registered residence in the territory of the Republic of Serbia on December 31, 2016, as well as on the day of submitting the application, while at the same time being the citizens of some of the countries which were established within the territory of the SFRY. With the application for admission to the citizenship of the Republic of Serbia, proof of residence in the territory of the Republic of Serbia, as well as a birth certificate and proof of citizenship of the country established in the territory of the former Yugoslavia must be submitted.